According to a report picked up by Photo Rumours Sony Japan is officially discontinuing the 16.2MP a55. Sony launched the Alpha 55 and Alpha 33 in September 2010. These camera bodies marked the debut of the Single-Lens Translucent (SLT) Alpha range, featuring a line-up of DSLR-styled cameras fitted with translucent mirrors and electronic viewfinders. The fact that the SLT mirrors are fixed and allow most of the light to pass through them enabled Sony to achieve phase detection focusing in live view mode and shooting speeds (10 fps in the a55's case) in cameras at affordable prices. Both cameras introduced HD video shooting to the Sony Alpha range, too. The entry-level a33 was discontinued by Sony Japan in 2011, to be replaced by the a35. 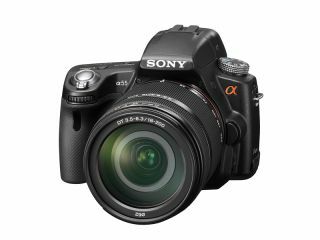 Sony went on to release the mid-range a65 in October to sit alongside the high-end Sony a77, but the a55 remained in the Alpha SLT system. Until now.